This article was originally published in the July-August 2018 edition of the ITI Bulletin, and you can download a PDF version here. As freelancers, we hear a lot about the importance of keeping up with continuing professional development (CPD) and of networking. Some people embrace this wholeheartedly, while others see CPD and networking as necessary evils. However, some of us see the benefits of CPD and networking but just don’t get many opportunities to take part. I’ve been a freelance translator and editor for three years now, and I’ve met very few colleagues in person. This is due to my lifestyle – although I’m based in the UK, I spend much of my time abroad, first in the US and now in Mexico, due to my partner’s work. While I appreciate the freedom that being a freelancer gives me, I seem never to be in the right place at the right time. I’ve long been jealous of colleagues who are more easily able to attend conferences. I knew I wanted to take that step, but I had to find the right opportunity. 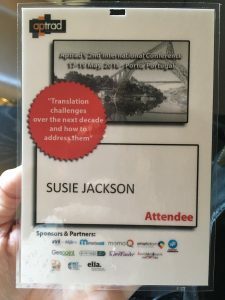 That finally happened this year, with the second international conference of the Portuguese Association of Translators and Interpreters (APTRAD) falling during a period I would be spending in the UK. This seemed like the perfect opportunity. 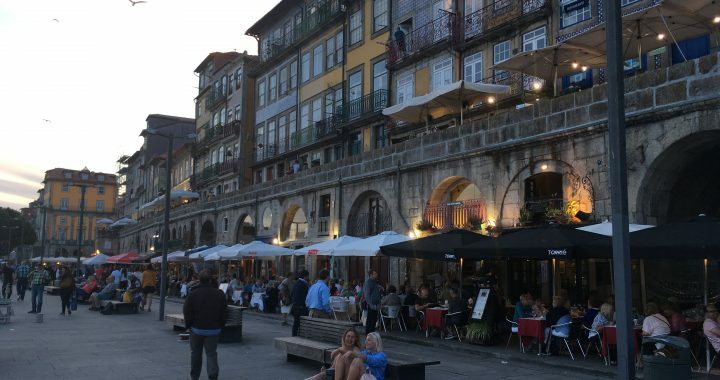 It was in Porto, a city I have lived in and love, and I would get a much-needed chance to practise Portuguese, one of my source languages. I quickly booked my place, excited finally to be able to join that elusive club. As the conference drew nearer, my nerves started to build. I was very aware that I didn’t know anyone else who would be attending, and it doesn’t come naturally to me to approach people I don’t know. Another thing that bothered me was what to wear for the conference. This might seem like a silly thing to worry about, but I’d never attended anything like this and didn’t want to stand out for the wrong reasons. In the end, however, the conference was an immensely valuable experience and I’m so glad I attended. I learned a lot from the sessions I went to, returning to work enthused by the possibilities for my business. I also met many lovely people and now know colleagues who work in similar language pairs and subject areas, which has already led to collaboration. By the time I left Porto I felt as if I’d known these people for years, and I’m sure I’ll keep in touch with many of them. So if you too are hesitating about dipping your toe into the conference waters, here are my tips for how to get the most from attending a conference for the first time. If you’re attending a conference for the first time in a city you’ve never visited or where you don’t speak the language, you’ll be putting additional pressure on yourself. If possible, choose a location you’ve visited before or where you know you’ll be able to communicate with those around you. It’s well worth making life easier for yourself! The majority of us spend most of our time working alone. The conference will be tiring and you’ll probably be tempted to skip some sessions, stay in bed that little bit longer, or catch up on some work at your hotel. Don’t listen to your brain when it tells you to do this. After all, we can do those things whenever we like, but it isn’t every day we have the chance to meet and learn from colleagues. I attended the maximum number of sessions possible, and I was glad I did – there were some I wasn’t sure about from the title and description, but I learned something from them all. Say yes to opportunities to socialise. Other freelancers aren’t so scary when you actually start talking to them. If you’re nervous about this, try opting for small social events with few attendees. The size of the group will mean that everyone is involved in conversation, and someone you meet there might be able to introduce you to others later. Don’t be afraid to go up to the speakers after their presentations, too. They’ll be happy to answer any questions you have and it’s another way of making contact with someone more experienced. If you’re familiar with any of the speakers – you receive their newsletter, have seen their posts on social media, or have attended webinars they’ve presented, for example – send them an email before the conference starts to tell them that. This gives you a connection and a reason to then approach them at the conference. The same can also apply to other attendees if the conference website publishes a list of the other people who’ve registered. Conference organisers have a short window to pack in as much as they can, so days will be long and full of activities. On top of that, you’ll be taking in a lot of new information, potentially speaking a different language, and travelling to get there and back again. Try to arrive well rested and allow a day when you get home to catch up on sleep. Most attendees will stay in or near the conference hotel. Price may be a consideration for you, but remember that you’ll have some early starts and long days. Staying somewhere that involves taking public transport may be something you’ll regret, particularly if you don’t know the city. Lots of people will give you theirs, and you’ll want to have something to give them in return – it will make you look more professional. If they can’t contact you later, they won’t be able to send work your way or refer clients to you. You’ll meet a lot of people over the course of the conference, and by the end you may find it difficult to remember who does what and to put names to faces. If you’ve received business cards from people, think about writing a note on them to remind yourself of the areas they work in if they aren’t stated. If you arrange your travel so you only have time for the conference activities, you may find you never see anything of the host city. Many of us don’t find it easy to take time off very often. As you’ll be in a position where you can’t take on any paid work for a few days, why not extend that a bit and make the most of it? You’re there already, after all. You might be overwhelmed by how much you still don’t know and still have to learn. Just remember that others are very supportive of anyone who wants to put in the work to improve. And by the time you come away you will have already built up your experience, ready for the next conference. Posted in Resources for freelancers.